I love a green sauce. They seem to have magical properties; they go with everything (Meat! Fish! Vegetables! Just dip some bread in it! Eat some right off a spoon!) and they make the sometimes dreary business of eating a ton of vegetables a total delight. They impart this lovely, summery freshness, even if the summer is a long way off. It’s never a bad idea to double the recipe because leftover green sauce can find it’s way smeared onto sandwiches, thinned out into a salad dressing, or pepping up any droopy leftovers that need pepping. I have a loose formula for a green sauce is endlessly variable, but broadly as follows: a load of herbs (more than you think), something bright and acidy (lemon, vinegar), something pungent (garlic, shallot) and some salt. They might have something spicy (they probably should I think), creamy yogurt or any number of other variations. But every tweak just seems to result in another great green sauce. This one was an attempt to loosely reproduce a really tasty mint sauce I had served on fish and chips recently. It was such a good and unexpected move to swap for standard tartar sauce with a bright-tart mint sauce. I suspected it would be equally good on some healthier vegetables, and it was. Don’t feel limited to cauliflower, put this on whatever you fancy. 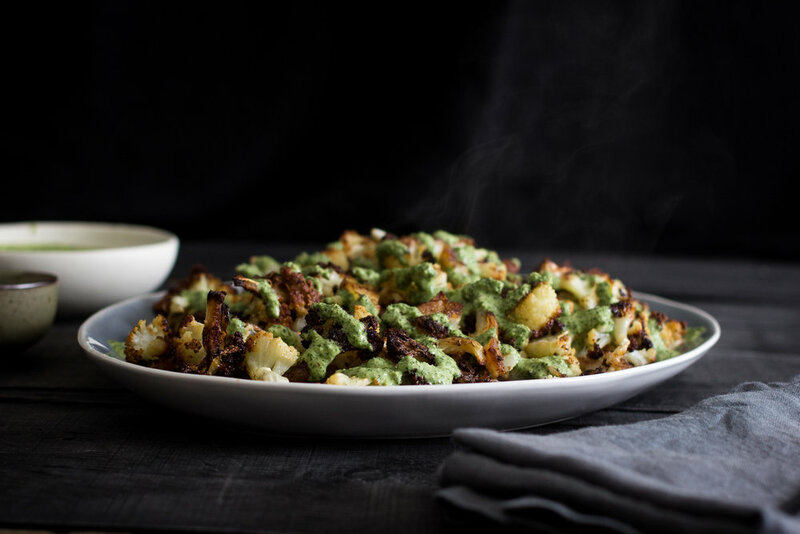 Some more green sauces I love: chimichurri & spicy cilantro green sauce. Blitz all ingredients together in a food processor until smooth. Heat oven to 450°. Toss cauliflower in oil, salt and spices. Roast on a sheet pan for 15-20 minutes, turning the florets every 5 minutes to cook evenly, until it’s golden brown all over. Serve drizzled with mint lime sauce. I’ve got bundt anxiety. I'm not sure it’s medically recognized yet, so I'm self-diagnosed. But it's quite real. Bunt removal issues race through my mind. It just seems like, the cake would naturally get stuck in an intricate pan like that, with extra edges and crannies, to catch the cake and tear it. I’m not crazy about nonstick pans, so I have a couple bundt pans in other materials, but I was nervous about their stickiness. Was I setting myself up for a failure? And should I use butter, oil, cooking spray or shortening to grease the pan? And should I dust with flour? Should I remove the cake from the pan while it’s still hot? Or wait until it’s entirely cooled? Or remove when it's sort of in between? I have indulged and fed my anxiety by spending time on a number of bunt removal forums, just like a hypochondriac googling their symptoms. The debates are heated between the pro-butter camp, the anti-butter camp, the baking spray enthusiasts. I’m would rather not buy any special things when I don’t have to, and I don’t usually use baking spray so I settled on melted butter and flour. And it worked brilliantly! The bundt popped right out with no hesitation at all. I waited about ten minutes after I pulled it out of the oven, and flipped it out onto a cooling rack. For this bundt, I adapted a streusel-y, cinnamony, tender New York coffee cake, flipped so the crumb topping sits on the bottom of the bundt and I added a ribbon of brown sugar and cinnamon through the middle of everything. A drizzle of vanilla glaze is optional, but lovely. Thoroughly butter your bundt pan, using a pastry brush. Shake flour in pan, making sure to cover all surfaces. Tip out any excess flour. Heat oven to 350F. Combine flour, baking soda, baking powder, and salt in a medium bowl. Beat butter on medium speed in the bowl of a stand mixer 2-3 minutes. Add sugar and beat until fluffy, about 3 more minutes. Add egg, beat until well incorporated and then add sour cream and vanilla. Scrape bowl and beat briefly to incorporate everything. Add flour mixture and beat again on low speed until just incorporated. Scrape bowl and beat again very briefly. Spread a little less than half into prepared bundt pan. Sprinkle cinnamon swirl over batter and add remaining batter on top (cake will rise substantially - do not fill it more than ⅔ full). Smooth with a small offset spatula. Sprinkle crumbs over the top. Bake for 30-45 minutes, rotating cake halfway through. Cake is done when a toothpick inserted into the centre comes out clean. Mix together in a medium bowl until evenly combined. Clump mixture together by pressing with a fork. Break into small crumbs. Combine everything in a medium bowl, mix until evenly combined. Adjust with more milk or sugar to get a runny, but not thin consistency. It will be slightly thinner on the cake than it looks in the bowl. Drizzle over cake once completely cooled and let set about ⅓ hour. January always starts off for me with enthusiasm and resolve (even if I don’t really make resolutions, the season is so resolution-y it catches on). Plus, at the beginning of the month I usually still feel a bit unwell from all the holiday over-indulgences so it’s easier to eat more healthfully. But as January drags on, and it’s still cold and my resolve to do anything other than watch Netflix and order takeout wanes. The healthy meals I had dreamed up are just not going to cut it if they aren’t also super substantial and hearty and really tasty. This salad does it all: ample greens and squash provide enough vegetables so that you can still feel plenty of health-smugness, but feta, avocado and wheat berries make it hearty and satisfying enough to help power you through the rest of the dreary month. The dressing is tart and just sweet enough to take the edge off the lime sourness. The wheat berries, roasted squash and can be done in advance and just sit in the fridge waiting to get tossed together with everything else and ready to eat in less than 5 minutes. It’s everything your late-January needs. Halve the squash and scoop out the stringy innards. Slice into thin rings and toss with oil and spices. Roast at 450F for 15-20 minutes turning slices halfway through. Set aside to cool slightly. Toss greens, cheese, avocado and wheat berries. Lay slices of squash over top and drizzle with lime dressing. Blend everything together in a mini food processor (or whisk together, but make sure to finely mince the garlic first) until emulsified. Taste and adjust seasoning and sweetness. If you are like me and have fond childhood memories of eating uncooked ramen, you can now mask your it as a (relatively) sophisticated recipe appropriate for Grown Up consumption. It's toasted and everything, so it's definitely not raw. I'm good right? This snack mix is perfect to take to a holiday party. You can substitute in whichever nuts you prefer, freeze dried peas for the corn, chex cereal for cornflakes. Generally add or subtract whatever you want, you can’t really make a mistake with this. Break up ramen into bite sized chunks. Toss noodles with nuts, pretzels, cereal and corn. Melt butter in a small saucepan with soy, Worcestershire, olive oil and miso. Stir until evenly combined and drizzle over noodle mixture. Combine spices with ramen flavour packets and sprinkle over snack mix. Toss until everything is evenly covered in butter and spice mixtures. Spread mixture into two casserole dishes and bake at 250F for about 40 minutes, tossing the mixture every ten minutes or so to make sure it browns evenly. Let cool and store in an airtight container. Mix will keep about a week, and if it lasts that long I’ll be super impressed. This cake is inspired by Christina Tosi’s apple pie cake from the Milk Bar cookbook. Christina Tosi is obviously a total genius and the cake is amazing exactly as her recipe is written, but I couldn’t resist a making a few twists and variations on her version. I swapped out the frosting for my favourite ermine frosting, which I think is a bit lighter and less sweet. I ditched the liquid cheesecake which, though totally delicious, isn’t very apple pie-y and I added a little slip of salted caramel. This cake is quite involved, with many steps and components but it’s worth it for a real showy, grand finale worthy of finishing any festive meal you have planned. Or it would be an amazing birthday cake for an indecisive friend who can’t choose between their twin loves: pie and cake. 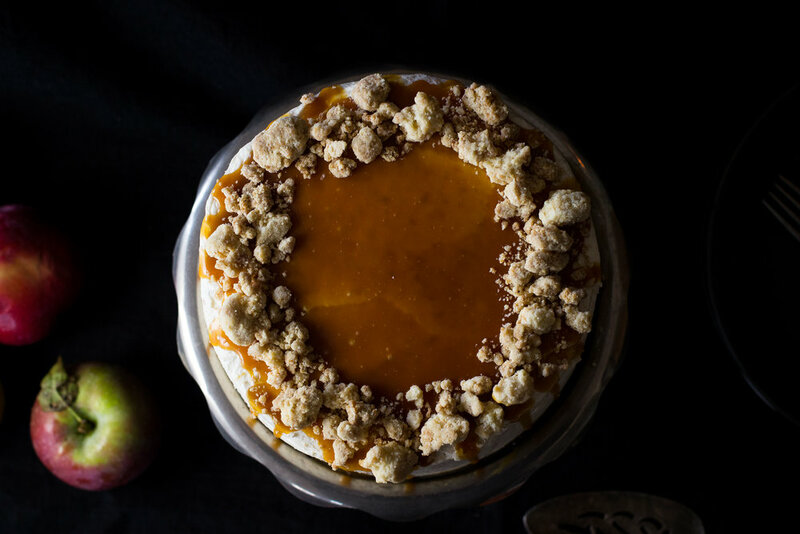 You can do a lot in advance: pie crumbs keeps well in the fridge or freezer in an airtight container, cake can be baked a couple days in advance and tightly wrapped in saran wrap in the fridge, the cider soak and caramel can also be made well in advance. Having these components done when you actually want to get the cake assembled makes it much less overwhelming. Brown butter in a small pan on medium heat, the butter will sputter and spit. Watch the butter constantly and stir occasionally. The butter will turn golden, then nut brown. Remove from heat at this point, it can burn very quickly after it browns. Cool completely in the fridge and then bring to room temperature. Heat the oven to 350° F. Combine the brown butter and sugars in the bowl of a stand mixer. Mix medium-high with the paddle attachment until pale and fluffy. Scrape down the bowl and add eggs one at a time, mixing between additions. Scrape bowl and mix on medium-high for a couple more minutes. Slowly add buttermilk, oil, and vanilla with the mixer on the lowest speed. When just incorporated, increase the speed to medium-high and mix for about 5 minutes, until the batter is very pale and fluffy. Mix in flour, baking powder and salt and mix on lowest speed until incorporated. Scrape sides and mix again briefly. Check for lumps and unmixed spots. Line three 6” springform cake pans with parchment. Divide batter between pans (a large ice cream or cookie scoop with a release is handy for getting even distribution). Bake 25-30 minutes, or until a toothpick inserted in the middle comes out clean. Cool cakes completely before frosting. Chilling or freezing the layers will make them firmer and easier to frost and assemble. Combine the flour, sugar, and salt in the bowl of a food processor. Add the butter and water and pulse several times until the mixture forms small clumps. Spread the crumbs evenly on a parchment-lined pan. Bake for 20-25 minutes, tossing them occasionally. They are done when they are golden brown. Let the crumbs cool completely before using in a recipe or eating. Stored in an airtight container, the crumbs will keep fresh for 1 week at room temperature or 1 month in the fridge or freezer. Cook milk and flour in a small saucepan over medium heat, whisking constantly until the mixture thickens to a gluey, pudding consistency. Cover the pan and cool to room temperature. It needs to be completely room temperature before the next step or it will melt the butter. At this point you can chill this mixture to make the frosting later, but if you do, do not proceed before bring back up to room temperature - cold flour mix added to butter will seize and split the frosting. In a stand mixer with the paddle attachment, whip together butter and sugar on medium speed until light and fluffy, about 5 minutes. Add in room temperature milk mixture and increase speed to medium-high. Whip until the mixture is smooth and very fluffy, which can take more than 15 minutes sometimes. It may look split or grainy or weepy at some point, but just keep on mixing until fluffy and velvety. This always takes way longer than I think it should, so I recommend that you walk away at this point and don’t look at the frosting more often than every 5 minutes. I like to use this time to do some of the dishes I have made or have a snack. Just don’t stare at your frosting getting stressed out. When you have smoothness and fluffiness, add the vanilla and beat until fully incorporated. Add the pie crust crumbs and beat to incorporate. If your frosting becomes a little soft and droopy at any point, chill it in the fridge for about 10 minutes, and the beat again. Repeat until frosting is smooth and holds a peak. Cook all ingredients in a small saucepan until the apples are tender but not mushy. If liquid is still very thin, remove apples and continue to reduce until syrupy and about half of the original volume. Toss with apples. Combine all ingredients in a plastic squeeze bottle. Chill until ready to use. Melt sugar in a pan over medium heat, stirring until fully dissolved. Continue stirring constantly until sugar is deep gold. Add butter and stir until incorporated into sugar. Still stirring, add cream in a slow stream. Sugar will bubble up. Continue cooking for one minute and then remove from heat. 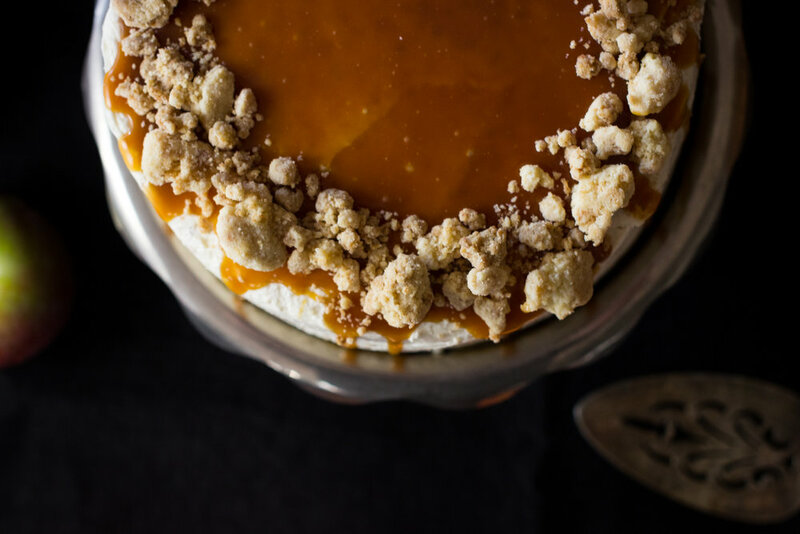 The caramel can be made in advance and stored in the fridge. Level cake layers and trim off the sides if you like - I like to because sometimes the sides are a bit more cooked than I want them. Drizzle cake with apple cider, either in a plastic squeeze bottle or with a pastry brush. You want to get good, even coverage without totally soaking your cake. Place a cake board, if using, or a very flat plate, onto a cake turntable. Put a layer on cake on the board and scoop on a generous layer of frosting. Spread evenly over the cake and drizzle caramel overtop (a plastic squeeze bottle comes in handy here too). Sprinkle on a little of the remaining pie crumbs (about ¼ remaining crumb). Repeat layering cake, frosting, caramel and crumbs with the middle layer, and top with the final cake layer. Give the whole cake a quick overall frosting, making sure to cover the sides and top entirely. Don’t worry about making it smooth at this stage, just frost it quickly. Put the cake in the fridge about 20 minutes. Remove from the fridge and frost again, this time taking care to smooth the sides and top, using a generous amount of frosting and then scraping off excess with a bench scraper or offset spatula. Chill again until frosting is very firm, about 30 minutes. Drizzle caramel overtop, dripping a little down the sides of the cake. Decorate the top with remaining crust crumbs. Chill the cake if not serving right away, but let it sit out for two hours before serving to come back to room temperature. This cake has a great origin story. Maybe too great. The suspiciously charming little fable - that it was a mistake, a baker got the proportions wrong and baked it anyway and it was a Bob Rossian happy accident - made me want to follow up and see if the story was real. The findings are inconclusive, though there is plenty of interesting controversy around the genesis of the cake, including an elusive bakery that might not have even existed! I tried this highly mythologized cake a couple different ways. From my hunting around, I saw that there seem to be two main varieties - one with a yeasted cake base and one with a more traditional yellow cake base. I did it both ways and I wasn’t very happy with the results from the yeasted version. It was tasty, but the layers were a bit too distinct and the goo sort of just sat there on top instead of getting involved and really smooshing in with the cake layer. In this version, you still get distinct layers of cake and goo, but with a much less stark boundary between them. The good sinks and pools into the base in spots, creating a rolling topography of crackling, crispy surface, a squooshy goo layer and just enough fluffy cake to keep everything together. This is an unfussy, unfancy perfect snack cake for serving with coffee for afternoon or taking along to a potluck. Or hoarding and eating all yourself. Using a stand mixer or electric beaters, beat butter and sugar until well combined and soft, about 3 minutes. Add egg, beating until incorporated. Add in all remaining ingredients and beat until evenly mixed. Set aside. Line a 9” x 13” pan with parchment paper and heat the oven to 350. Combine flour, baking powder and salt in a medium bowl. In a stand mixer, beat butter and sugars together until soft, 3-4 minutes. Add eggs one at a time, mixing and scraping the bowl between additions. Add vanilla and beat to incorporate. On low speed, add sour cream and flour alternately in 2 additions each. Scrape bowl well to make sure there are no unmixed ingredients left. Pour batter into prepared pan and dollop goo mixture over the top. Use a small metal spatula to evenly spread the goo over the cake. Bake about 50 minutes, or until the top is golden and the center is just slightly still wobbly. Let cool and slice into small squares.